The Laetoli hominin footprints have finally met their match. A group of footprints dating between 850,000 and 950,000 years ago were reported in coastal Happisburgh, the United Kingdom, as seen in a publication in Plos One today. The work was headed by Nick Ashton of the British Museum. Footprints are rarely preserved prehistorically—their survival generaly requires just the right level of moisture and sediment composition, followed by a low-energy depositional context to gently cover the impression. In fact, before this the oldest known footprints in Europe were approximately 350,000 years old, hailing from a steep slope in Italy. After this the record is again sparse, until we find a single footprint dated to between 97 and 63 thousand years ago in Romania, likely that of a Neandertal. 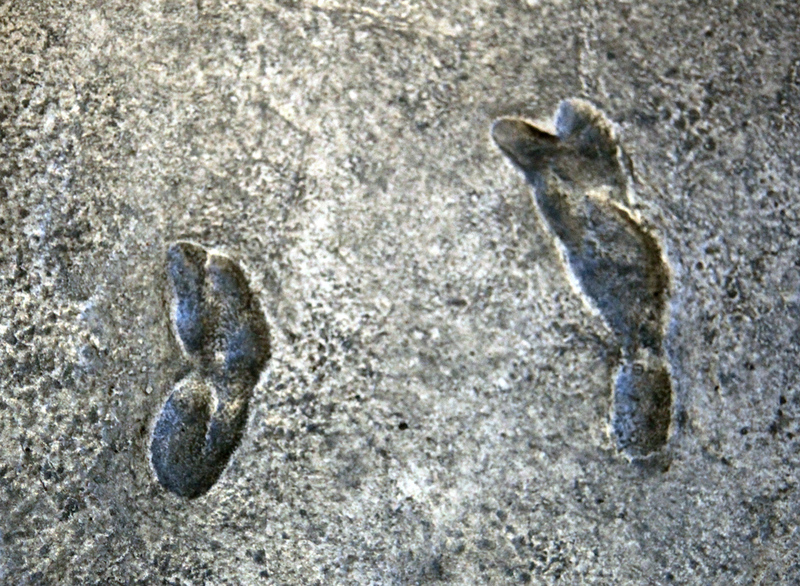 The oldest hominin footprints are found in Tanzania, and date to 3.6 million years ago (attributed to A. afarensis). The reported age of the geological layers exceeds the date of the oldest site in the region by 350,000 years, pushing back known human occupation in Northern Europe significantly. A number of individuals are represented by the imprints, and based on size ranged from juvenile to adult. Like us, these hominins had a big toe that pointed forward, and arched feet. It is possible that they were made by a species similar to Homo antecessor, a species known from the Spanish site of Atapuerca . Happisburgh hominin footprints, from Ashton et al. 2013. The researchers approximated the height of individuals in the group to be just below one meter, to 1.73 meters tall based on foot size to stature ratios. These estimates were based on the size of 12 relatively complete footprints, ranging from 14-16 centimeters. However, at least 49 footprints seemed to be present at the location. Unfortunately due to the erosional context of the find, the footprints were obliterated by the sea within a month of their discovery in May 2013. However, casts and photogrammetric models were constructed prior to their natural destruction for future study. I’ve been scratching my head since reading the article though—for such an important find, was it not possible to cut them out of the ground and remove them to a museum? The slab was reported to be 12 square meters, and you’d think that researchers would’ve gone to great lengths to preserve the originals at least partially. Maybe next time an invaluable slab of ancient hominin footprints erodes out of the shoreline they’ll be ready? Thanks a lot. This another example of archaic Homo living in coastal & riverside habitats (rather than running over open plains as some anthropologists & popular books on human evolution still believe). Reblogged this on anthropology at home.